This is a list of questions that people ask us about all of the time. We put them on our website to help you get your questions answered. If you have other questions or can't find the answer you are looking for, then please feel free to contact us. We are always in the office. What does a typical ICGH investigation look like? ICGH prides itself on the professionalism of our team. We visit a site and conduct a two-part investigation. We begin by doing a walk-through of a specified location as we gather information and talk with people who have knowledge of the paranormal activity. We also conduct a base line EMF reading as well as an EVP session at this time. We return after dark to conduct a normal night investigation with the aim of debunking any paranormal activity. How far will ICGH travel to help us? No, we do not charge for our services. We are all volunteers who neither accept nor ask for donations. Iowa City Ghost Hunters will travel all over Iowa, Illinois, Minnesota, Missouri, Nabraska. Do you use ouija boards? ICGH does NOT use Ouija boards. We do not feel that is it right nor safe to use one. Am I crazy for experiencing something paranormal? You are not crazy. You are not alone with this. Many people experience paranormal activity. We want you to know that you are not alone. ICGH is always there for you and your family. Can your group come back after an investigation? ICGH will come out as many times as you may want or need. We are always just a phone call away. What is the best way to reach Iowa City Ghost Hunters? You can call our office anytime you want. We always have someone at the office to answer you phone call. You can also send a message through our web contact page or visit our Facebook page. 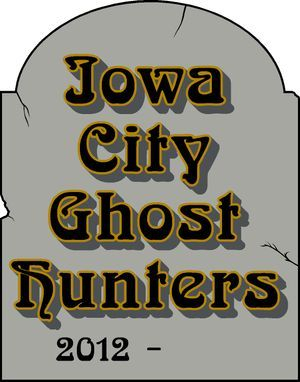 Does Iowa City Ghost Hunters charge people to volunteer with your team? NO, Iowa City Ghost Hunters does not charge a membership fee or anything like that. We feel that we have a great team of volunteers who work very hard to make sure our clients are taken care of. If your team does a great job, can I pay you or make a donation to your group? No, we do not accept any type of payment, no gifts or donations will be allowed. We ask that you don't give gifts or donations to our Non-Profit group. How can I join your Group as a paranormal Investigator? We are always looking for team members. We ask that you completely fill out the application under the "Join the Team" tab on our website. Once you fill out the form it will go to our Membership committee for review. The committee will do a background check and review everything on the form. If they feel that you should join they will contact you for a face to face interview. Once you are allowed to join, you will be places in a Temporary member ship called "training" once you complete the training you will be a full team member. How do I know if people coming to the investigation are real team members? All members of Iowa City Ghost Hunters are given team ID cards. YES, when we do an investigation we ask that you sign a confidentiality agreement. That means that you may talk about your case to anyone you want, but our team will not talk about your case without your permission. 3. Accommodations for pets and children under the age of 18 must be made prior to the investigation as they should not be present at the investigation location for audio corruption and safety reasons. 4. We will ask that all air conditioners, heaters, ceiling fans, televisions, radios and any other noise/dust producing apparatuses be turned off 1 hour prior to the the investigation. 5. Please, no smoking in the investigation location prior to our arrival. If needed, please smoke away from the investigation area. 6. Please allow enough time for the investigation to be completed. Paranormal activity can happen at any time day or night and there are variables to consider in how long an investigation can take. Usually, per investigation, it may take from 8, 12 or in extreme cases, up to 48 hours to collect evidence for analysis and up to four weeks to thoroughly analyze all video, audio and still pictures. Other circumstances have prolonged some investigations for days, weeks and even months depending on the amount and nature of activity. 7. If the recorded activity merits a follow up investigation, We will contact the client and make arrangements to do so at the clients convenience (with respect to prevailing circumstances). 8. You contacted ICGH for an Investigation of your property. This means that we come to help you at our cost. This means that we would like to keep communication open both to and from the client and Iowa City Ghost Hunters. Please remember, We do not charge for our investigation services. We conduct technological research and investigate reported paranormal activity. Through the investigation process, we record, log and analyze any and all recorded possible paranormal activity in an attempt to validate and document what the client has reported to have witnessed.